May I present to you my current obsession: Song triplets Daehan Minguk Manse!! Look at those adorable little munchkins!! Aaaakkk… I’m hysterical! Got me cuteness-overdosed every time I watch them! Those are their first appearance in the reality show The Return of Superman. Okay. So, Daehan Minguk Manse are Korea’s favorite triplets. Since they were born on 16 March 2012, by the time I write this post, they are 3 years old. They are not identical triplets, so people can easily tell them apart. Furthermore, they have totally different personality, which makes watching them more interesting. They appear in Korean variety show call “The Return of Superman.” In this show, celebrity dads are left by their wives to care for their baby/infant children(s) for 48 hours. Daehan Minguk Manse’s dad is Korean actor Song Ilkook. In this show, viewers will watch Song Ilkook taking care of Daehan Minguk Manse and doing various activities with them. Oh My God! How adorable. Beside of the triplet’s ‘hit-the-ceiling’ cuteness, Song Ilkook attentive attitude towards his triplets is quite heart-melting. I wasn’t this addicted to the triplets before. I knew about them in social media but it didn’t initially captivate me. I was like “okay, that show is about Korean babies.” But they are triplets, “okay, three Korean babies.” Nothing really special. At first I was like; ”yeah, whatever makes her happy.” But then, I looked it up on Youtube and I couldn’t stop until now! What I will write is not just facts about them, I might write just a tiny little fact even. I will mostly discussed about how I feel about those triplets (and their dad), my opinion, results of my observation from watching ‘The Return of Superman’ and my favorites. So here it goes. He’s the eldest of the three. In the womb his position was at the bottom, he’s believed to be holding for his brothers. He’s called ‘reliable Daehan’ because he acted like an older brother as he knew he was one. He is very attentive to his brothers and his appa (means ‘dad’ in Korean), he is often seen to feed his brothers. Among his brothers, he’s the calmest, the quietest. He always seems to listen to what appa said (just like a reliable big brother). It amazes me how he always looks after his dad’s bag when his dad is not around. He is also the least scared of dentist or doctors, and when it is time for injection, Daehan was the bravest and usually offers himself to be injected without his dad has to dragged him to doctor’s chamber. He didn’t cry (but on the other injection he cried a little) only frowned a bit and carried on. God, I want a kid like him, too!! Even though he cried on the second injection, he’s still the most mature among the three. Among the three, he’s the most comfortable with water environment (pool and water parks), totally unlike the youngest, Manse, who is scared of water. For that reason as well, Daehan is chosen to be swimming representative in the triathlon that his dad participated in. Later on, I will write about the triathlon that Song Ilkook and his triplets participated in. I think he understand photography and will likely to be interested in it. When he is equipped with a camera, he will be seen to take picture. Like when he’s on the trip to the beach after their third birthday and after they hiked (I think) the Hallasan trail in Jeju island. He was the first to reach the top and when he reached the top he took pictures from his camera. Btw, the triplet call cameras dinosaur (gungryung) or alligator (ageo). 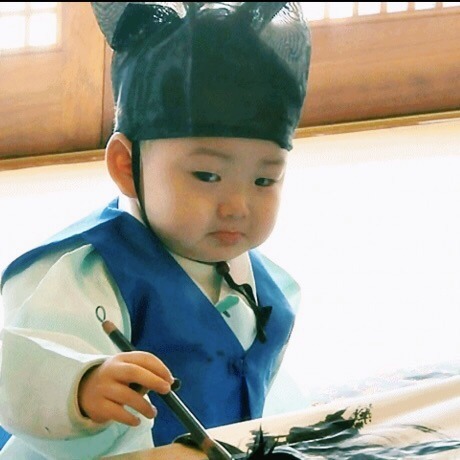 His dad said that Daehan is typically like him, Minguk his mom, and Manse is just a free spirit. Lol. Minguk the second triplets, the ‘cute Minguk’, my favorite! When I see him I really want to pinch his cheeks. Aaarrgh! He always looks so adorable with his wink and stuff. He loves to sing and dance. He sings, like every time and everywhere. My mother said that when I was a kid I used to sing a lot and remembered all the song lyrics. 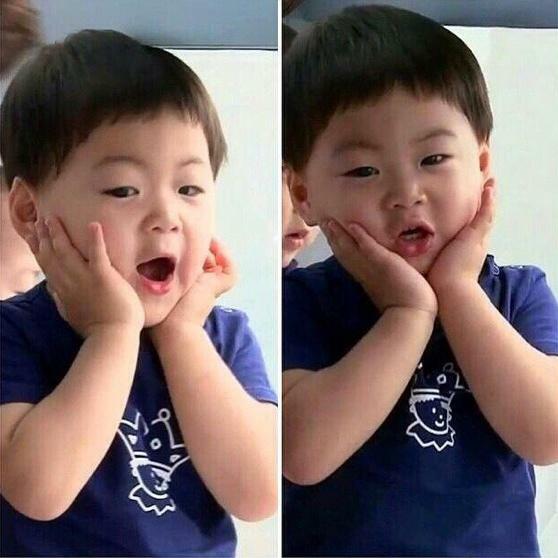 Just like Minguk-i, right? His most adorable singing moment when he sang ‘twinkle twinkle little star’ in the bus, in Japan, in English! The look on his face. Oh my God. Besides of his singing expertise, he’s also smart. On one of the episode, the Songs were going for grocery shopping. Daddy Song asked the triplets to bring him different items from each kid, such as garlic and other stuff. The three were both got distracted along the way, but Minguk is the only kid that manage to bring the stuff that his dad asked for by asking help from the supermarket staff. His brothers even completely forgot that they have been tasked. Which is normal for a 2 years old, but Minguk… he stole my heart by that scene. He even memorizes the difficult names of dinosaurs; diplodocus, edmontonsaurus, argentinosaurus, etc (This is a made-up name from what I heard, I don’t exactly know the name, you can ask Minguk for that. lol). He can tell what his father name is, while two other brothers could not, and once again he’s good with errands. One time in a dry sauna, he was asked to buy rice juice and other snacks for the four of them but the errand was too many for his little hands that he dropped a bottle of rice juice and cried for his dad. You’re too smart for a toddler, Minguk! Maybe that is why he has the biggest head among the three. In one of the interview his dad said that Minguk had trouble keeping his balance when he was a baby because he has to carry his heavy head. I am sorry, but that is just too hilarious. He has the biggest appetite and he loves meat! How I love kids with big appetite. He melts people hearts when he does his killer wink. He also is so sweet, always telling his mom and dad “I miss you.” (I love you, Minguk!!). One occasion, Lee Hwijae (one of the Superman) and his twins spent a day with them. The last thing they did together was dinner. After dinner the two families had to go separate ways. When the twins’ dad said his goodbye, Minguk suddenly said, “Gajima!” (means: don’t go). At that time, I wish I was Lee Hwijae. Free spirit Manse. What are you doing there, gorgeous? Fyi, Daehan Minguk Manse literally means Republic of Korea, yeay! (Republik Korea Jaya). Maybe that’s why Manse has such a free spirit, spirit of cheerfulness, and he’s called ‘free spirit Manse’. He’s the rebel of the bunch. I can smell it. Haha. He is always the most comfortable with strangers. I think he does not mind any stranger at all. In a lot of scene, he will be seen comfortable doing stuff with other family while his two brothers are assisted by their dad. Unlike Deahan, sometimes Manse could be clearly identify as the youngest (even though when asked who’s the eldest Manse will always answer that he is the eldest. Lol). He is the most likely to ask for help either from his appa or from his brothers like, “Deahan, could you please give me water?” “Appa, could you please help me with my food?” etc. He laughs harder when his dad yells “Ya! Ya! Manse-ya!” (see, he’s a rebel). But he’s also the most sympathetic towards his brother. He will cry whenever one of them gets in trouble. Like when Minguk cried because he accidentally fell from his dad’s hug, Manse cried and even said “nappa” (means “bad”) to his dad. Manse also cried when he saw Minguk cried while having his runny nose wiped by his dad and also when Minguk was scolded by the teacher in the folk village because he brush the floor with ink. In other occasion on the folk village Daehan and Minguk are punished for not being able to finish their breakfast, Manse (who did finish his breakfast) cried and took the punishment as well. Manse loves cars and, I think, Sarang-i nuna too (Choo Sunghoon’s daughter Choo Sarang). The triplets all love ‘Robocar Poli’ but Manse really has special interest with cars and driving. He always tries to take the wheel of their family car whenever he has a chance. Manse is very attentive towards Sarang. Sarang’s favorite triplet is Manse, and Manse asked a lot about Sarang after their meeting. Those two are clearly the flower of the scene when they’re together. How adorable. In my opinion, in terms of physical appearance, Manse will look like his dad the most. Little Manse was trying to pass the fence. As he failed, he blew on it. The triathlon episode is my favorite part. One of Ilkook’s dreams is to finish a triathlon with his triplets. Since there are three stages, each of the triplets will represents one. The sequence was Daehan for swimming since he’s the most comfortable with water, Minguk for cycling because he rides the scooter well and Manse for running because he just loves to run, especially from his dad. I personally think that is impossible. To finish triathlon on your own alone is already a hard work, let alone carrying a child in each stage. Even though he came last, he has proved to be a superman. Despite of being a tough moment for his dad, this triathlon was also tough for the kids, because in each stage they had to endure for at least 40 minutes in the carriage until their dad finish. I think by that time the weather is quite cold. Sometimes, they fell asleep, but then when they woke up they cheered his dad, “Appa fighting!” For me those are so adorable. When approaching the finish line, Ilkook was with Manse. Near the finish line, Sean (celebrity, a family friend who also partook the triathlon) help Daehan and Minguk carried a small banner for his dad that says “Appa, I love you!” and then they crossed the finish line together. Watching and observing those triplets are very fun. I can only see how adorable they are that it must have been fun and everything. But the thing is having triplets are tough. Babies from multiple birth are usually tiny and fragile. That is due to the limited capacity of human womb. Tiny babies are prone to development challenges. Manse was born with only 1.81 kg of body weight. He was only as big as a coke bottle. Minguk has atopic dermatitis that irritated his skin. So that his parents literally had to stay awake all night to prevent Minguk from scratching himself while he slept. Conceiving multiple babies is also tough. I remember Song Ilkook interview about his wife’s hardship during the last month of pregnancy. He said that one day they were going home and have parked the car and everything. By that time, his wife still have around one month before labour. The car was just parked about 10 m from the front door but when Ilkook reached the door, his wife was standing by the car in tears; she said that it was too painful to walk. Because of that they stayed at the car, crying. Aah, poor thing. Daehan Minguk Manse, you kids really have to be good sons for your parents. Although it seems like super tough, I would want to have kids on my own. Someday, hopefully. Haha. Sorry that it has been a very very long post. I took a lot of time writing this. I hope it’s enjoyable, especially for Song triplets’ fan out there. This article makes me sooo happy. Song triplets are my happy pill. Thank you! Much happiness is written through this article. They are such happy pills, indeed. Glad it makes you happy, too.